In the era before Oz secured world championship grand prix and superbike races, the annual Castrol Six Hour showroom proddie bike enduro could not be topped. For 18 years, oft controversial, usually dramatic, the Six Hour was simply the biggest thing in local motorcycle racing. Its popularity coincided with a boom in the sales of bikes. Fortuitously, too, television quickly discovered its magic and Seven and then the ABC telecast the race to the nation from 1971 onwards. The race somehow captured the imagination of the public and every race was seen by big crowds, initially at Amaroo Park (1970-1983) and thereafter at Oran Park (1984-1987). It is a mad coincidence that the Castrol ceased the very year that Australia produced its first 500cc world champion. That rider, Wayne Gardner, who also won two Six Hours before he headed for international glory. Gardner was by no means the only global star - then or later - to contest the Six Hour. Mick Doohan did too, and Kevin Magee, who won the final two Castrols. The roll call of winners includes Bryan Hindle, Len Atlee, Gregg Hansford, Kenny Blake, Murray Sayle, Neil Chivas, Rod Cox, Andrew Johnson, Mal Campbell, Mike Dowson (a three time winner), kiwi Neville Hiscock and Zimbabwe's Dave Petersen. The race also attracted big names from the world stage, including Mike Hailwood, John Kocinski, Ron Haslam and Mick Grant. It was a race for bog standard machines. No mods whatsoever were permitted and many who sought to challenge that rule ended up feeling the pain of disqualification. Politics was never far from the surface around the Six Hour. Organiser, the Willoughby District Motorcycle Club, had its own unshakable view of the appropriate regulations for the production race. The club hit on the idea of a production bike endurance race and all the top riders and many manufacturers leapt at it - 64 entries at the inaugural race in 1970 (called the Castrol 1000 that year). A decade after the close of Amaroo and a year from saying goodbye to Oran Park, it's timely that a record in photos and words has been compiled on Australia's most prominent domestic motor race. Former competitor Jim Scaysbrook, a wonderful keeper of the flame, has created The Castrol Six-Hour Production Race, 240 pages oozing with memories. Scaysbrook is a thorough researcher who never puts himself under time constraints. He gives the Castrol story the right balance of colour and reportage. 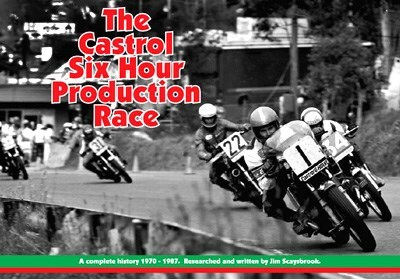 Published by Renniks and priced at $69.95, the hard cover book doesn't promise to be an utterly faithful record of Castrol Six Hour history, but it sure does a pretty handy job of getting close. It's a thoroughly entertaining read-romp across nearly two decades of Six Hour deeds and reminiscences. That same race ended in craziness when the winner Joe Eastmure's Suzuki was disqualified at scrutineering, officially because its horn had been relocated. That was the Castrol....mad from start to end and beyond.